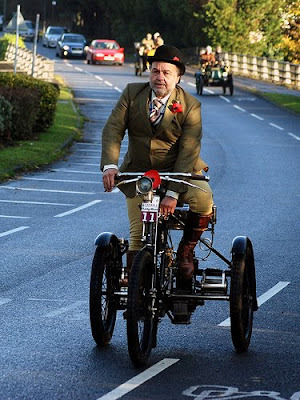 Tomorrow, Sunday, is the annual London to Brighton Veteran Car Race. It is held every year, but there is usually too much standing around in the cold for me to go; tomorrow's sunrise forecast is 14 degrees Celsius, so I will go. I can hardly be live that this vehicle is one-hundred and eleven years old. Live from the Carnival Dream in Barcelona! I am coming to you live from aboard the Carnival Dream docked today in Barcelona. I wanted to share with you and your bloggers my experiences so far with my Travelscoot. It has worked out extremely well for me on this trip and I am so glad I purchased my silver “Chariot” which is what we’ve come to call her . We had no problems with United Airlines and the batter issue that I feared. I decided to only travel with my standard sized Li-ion and bring both it and the SLA to keep weight down. When asked by United staff on what kind of battery it was I just said oh, I don’t know, it is a sealed kind that is approved for airline travel by DOT and that worked. I drove it down the jet way and they carried it to the luggage area for me. When we arrived in Rome the baggage handlers took it to baggage claims and not the gate but they radioed someone to bring it back and that went smoothly. 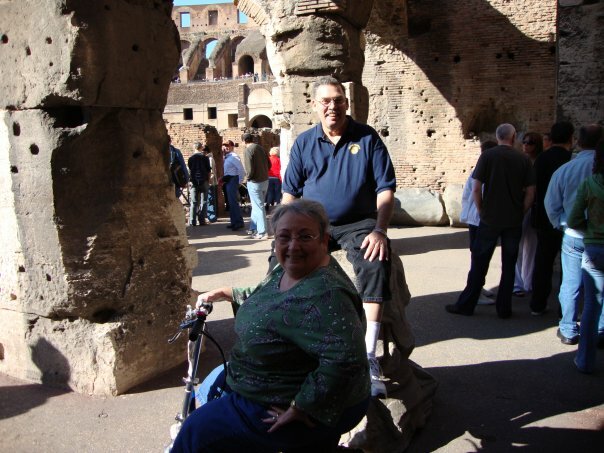 We were only spending two days in Rome before boarding out cruise ship. We arrived in Rome early the first day so we didn’t do much due to jet lag except explore the streets and area around our hotel. The Scoot did well over the uneven pavement and was easy to lift down and over curbs. 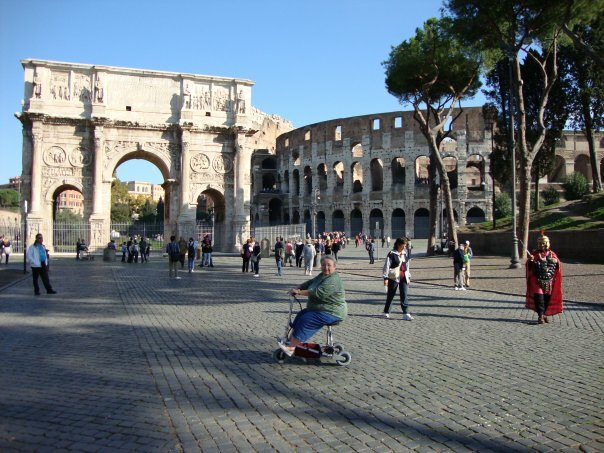 Our second day we had a “Highlights of Rome” tour booked and we wouldn’t have been more pleased on how well the Scoot did over the cobblestones at the Vatican, the Colosseum, Tivoli Fountain; Parthenon etc.. It was a real joy to ride all through St. Peter’s Square and St. Peter’s Basilica as I would never have been able to do this under my own steam. The only stop that I was not able to participate in was the Catacombs but they had wonderful gardens that I was able to enjoy. The tour operator had a 8 passenger van that had room for luggage in the back and we could lift the scoot in and out at all stops. My “Chariot” has been perfect for getting around the Carnival Dream which is Carnival’s new mega ship at 135,000 tons. This ship has a wonderful wrap-around promenade which we’ve enjoyed taking “strolls” around. I am getting many questions about the Travelscoot and a lot of thumbs up for it’s design. Thanks Hardy! Today we did a tour of the Freixenet winery and once again the Travelscoot was my perfect companion. Luckily for me the winery is very handicapped friendly. I was able to use an elevator to reach all 4 levels of the cellars. Fascinating tour. 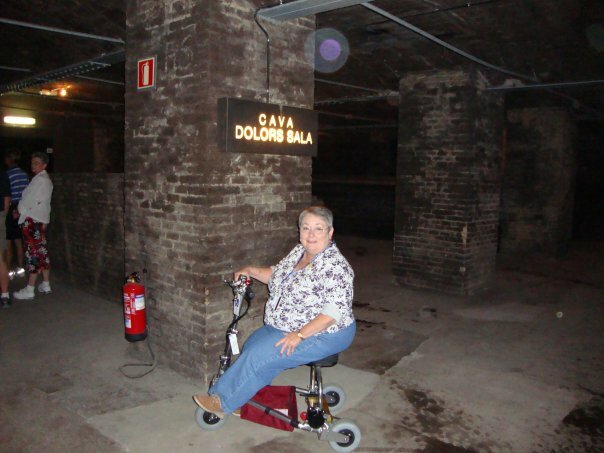 From what I’ve learned, Barcelona is a very friendly city for the handicapped. So, this is where I leave off for now. All aboard has just been called and we will be setting sail for our next port of call, Palma De Mallorca where we have booked a tour of Valldemossa, Deia & Soller. 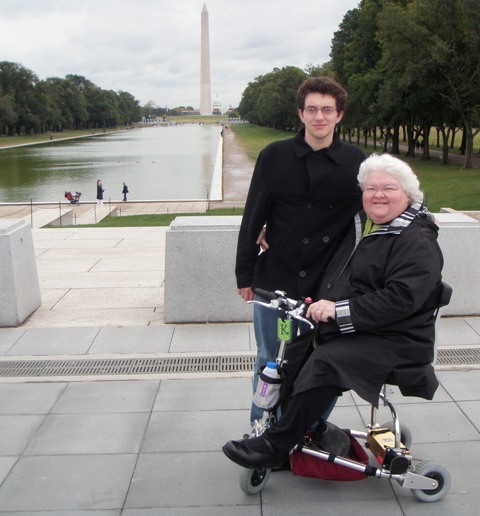 I hope we have as much freedom here as we’ve had so far…..
Kay used her TravelScoot for a new adventure -- visiting her son Ben at George Washington University. While she and her husband were there, they did some sightseeing. Isn't this a great picture?! Ben also just happens to be my youngest nephew, and one of my favorite people in the world. Having her scoot enabled her to do a lot more than she could have walking, and without being so exhausted. They "walked" from their hotel to campus and also walked 15 blocks to see the Washington Monument. She's got Leo (the larger lithium ion battery) and it worked beautifully. In the picture you can also see that she has the black and silver version of the Think-King cup holder. I love mine because it folds up with the scoot, and if there's not a drink in it it'll hold a lot of other things, like glasses, car keys, and my camera. Her hubby has also noticed that she has more energy when she gets home at night to do other things, like cook, and it has also helped lessen her pain. What I love hearing is how people she sees every day on her commute from New Jersey to New York have made comments about how she's smiling or about how cool her scoot is. Our sister Rae got her the lime green tag on the front with the "K" on it. It's a luggage tag. I have one on my scoot all the time too. It's fashionable and functional. 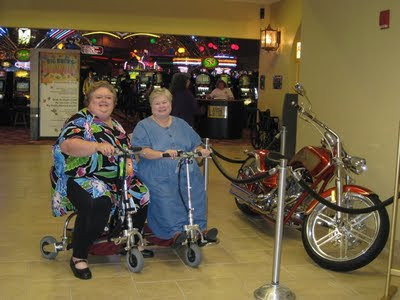 Rhonda says this is what she wants her scoot to be when it grows up! Last Saturday night our husbands took us to a Willie Nelson concert at the Paragon Casino in Marksville, LA. I hadn't been to this casino in years and never for a concert. I was amazed at how many people were there on wheels. I saw dozens of scooters and electric and manual wheelchairs. These weren't all elderly people either. It makes me wonder why I don't see more people on wheels in my everyday life. I certainly understand why they were at this casino though. It's easily the most handicap friendly place I've ever been. I think I rode over acres of carpet and my Leo the L'ion battery handled it beautifully. We were there for 4-5 hours and my motor only overheated once. Rhonda had her smaller l'ion battery (the cub), and it worked beautifully. The concert was in the Mari Showroom, and it was very size friendly. No matter what size of large you are, there's a place for you to sit comfortably here. The seating on the floor is armless banquet chairs, and in the risers they have theater-style chairs with arms that go completely up. Staff members greeted us as we rolled in, and they gave us special seating (because of our scoots) that was better than what we'd reserved. Alan and Dave rode our scooters off to the side of the room so no one would trip over them. They disconnected the batteries, just to make the scooters less attractive, but next time I think I might take the handlebar bag and lower the handlebars and attach the bag over them, like you do for airline trips. I can now carry a cup of coffee in one hand while traveling. My co-workers have learned to listen for the sound of the Scoot so they know to clear the way. No, I haven’t run anyone down yet, but I have been told that there is now a 2 mph speed limit in the hallways. In general, people are nice and helpful. I’ve made two trips to the malls – not because I needed anything, just wanted to ride. Its soooooo cool! Yesterday I got brave enough to try an outdoor festival. 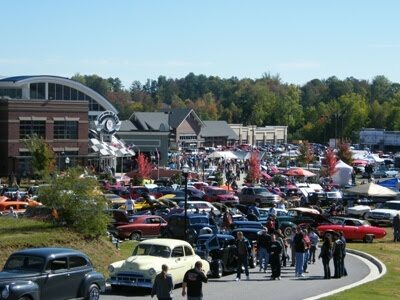 We have a Moonshine festival in Dawsonville every year. They block off the main roads around the courthouse for 5 blocks to show off all the old cars that were used for running ‘shine. Of course there are lots of venders, etc. Parking is blocks away, and I’d stopped going for this reason. This was the first time I’ve had to deal with hills. Not a problem at all. I didn’t even get to amber and I made half a dozen circuits. Yes, I got asked about the Scoot. While everyone thought it was cute and nifty, most thought the price was a little much. I reminded them that not only is it easier to deal with, they won’t have the expenditure of a special vehicle. I have noticed that there are basically two types of people who ask why I’m using the Scoot: those who want to find a reason I don’t need it and those who want to compare their problems to see if it’s the thing for them. I’ve actually learned to just tell people that I have CWF (short for ‘can’t walk far without being in extreme pain, you blooming idiot’ – this is the nice version of my thoughts). It’s amazing that people don’t realize that having a nicely working body simply doesn’t compare with having to use a mobility device – no matter how cool it is. In 7 1/2 years of living in Baton Rouge, this is my first Hollydays event and I spent it scooting through 70,000 square feet of "festive holiday finery." At the end of the day, I can still walk, I can still breathe, and I'm not in severe pain. Leo the l'ion (the new, bigger lithium ion battery) definitely got a workout with me today. I pushed it on some pretty good inclines and rode it on carpet for a couple of hours. It did not overload even once, but after several hours I did start getting the amber light occasionally. Had I been using the cub (the smaller lithium ion battery) I feel certain I would have overloaded it, and probably more than once. Rhonda used her cub the whole time and never overloaded it or had any problems. That's the difference in how the TravelScoot motor and battery handles her weight and how it handles mine. In my normal day-to-day use at work I never overload my battery (and I use the cub for work), and my motor never overheats. It's just when I'm on it for extended periods of time pushing it on some more difficult terrain, like hilly sidewalks, handicap ramps and carpet. The best part was that we just had a wonderful time. Neither one of us had been to Hollydays before, and it's a very big event in our community. We got a number of "cool scooters!" comments. In the last picture of us above you'll see that we stayed to the very end. Those boxes in the background where the merchants packing up. 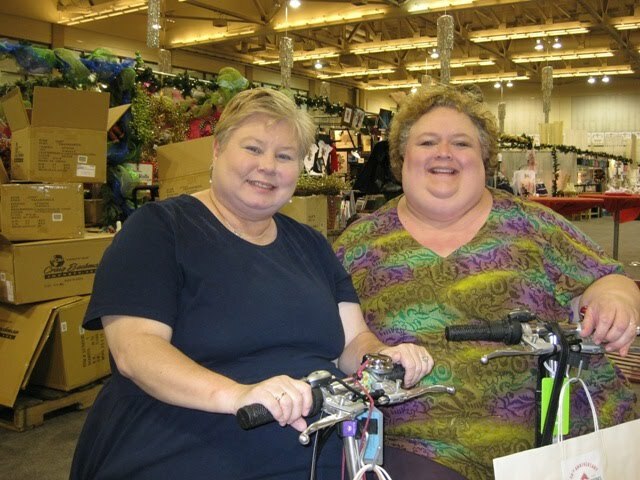 We were sitting and talking to three very nice women from Baton Rouge who were interested in our scoots. We both hope to see them again! Last of the Summer wine and my TravelScoot! 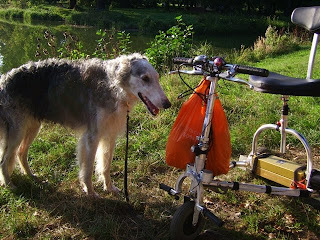 This is a nice photo of my TravelScoot in the sun having been ridden on grass; while out with a pal's pooch in Silesia Poland, last week. 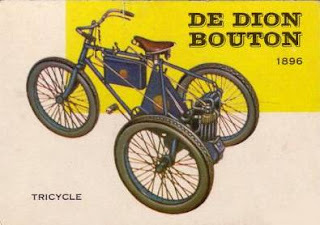 I'm close to ordering a TravelScoot (my b'day gift to myself), but still need to convince DH it's a wise investment. One issue I've not seen discussed is, using a TravelScoot in the winter. How does it do on slushy or icy pavements, or an inch or two of snow? What happens if it gets wet, particularly the battery? Living in upstate NY, this is an important consideration for me. Do you have any readers who might have winter experience with their TravelScoot? If so, I'd love to hear from them. Several of you replied, and I don't want anyone who just gets the email version of this blog or only reads it on Facebook to miss any of the wonderful comments and discussion. Welcome, Orla! You did great for a first blog post! Like every electric device it is not recommended to expose it to water and damages resulting from that will void the warranty. But I can put you on ease. Unless it's already raining in the morning, I commute almost every day with my TravelScoot the half mile from my home to the shop. But when it's raining in the evening I have no other choice than getting wet. So my scooter got wet already a dozen times and so far there were no problems. But don;t seek shelter and leave the scooter outside. Also avoid puddle splashing. Definitely do not use the TravelScoot in snow. Snow will easy get into the teeth of drive gear, getting compressed by the belt which eventually is getting too short and break. Freezing temperatures should not harm the batteries but the power and capacity is significantly reduced. Best is to keep the battery warm as long as you can. So far no feed back from customers in cold areas. This is a little bit discouraging, as we have quite a few months every year which are wet and/or snowy. I'd still love to hear from anyone who's using a TravelScoot in colder climes. 1) Scooters are useful only on cleared pavement. Rolling on even as little as an inch of snow is equivalent to a triple thick carpet up a ramp. It demands so much extra current from the motor and batteries, that they are likely to be cut out automatically--that is true even when the drive wheels have traction, which is doubtful in icy or slippery conditions, as in snow. The presence of very cold air would only have a slight effect on keeping the motor or batteries from overheating. 2) Sealed lead-acid scooter batteries do not fare well at temperatures below, say, 40 degrees F. for prolonged periods, such as overnight. They don't necessarily freeze, but when you need to use them, they can take a while to warm up. (They can freeze and be damaged below freezing temperatures if mostly in the discharged condition, but not if fully charged.) Therefore, in the northern states, scooters with batteries should not be left overnight in a vehicle in the winter, and if they are, only when fully charged. But if you have a heated garage, that's the place to keep the scooter overnight. Here's an alternative: Keep the scooter in the vehicle outdoors, but bring the batteries inside. This is harder to do with a conventional scooter, but easy, apparently, with the TravelScoot. 3) Lithium ion batteries are less vulnerable to cold temperatures. I have not yet tested them at sub-freezing temperatures, however. Despite all this, in northern states, there are lots of time in the winter when you can use your scooter to go to a mall or theater, for example, because where you have to drive is usually cleared of snow in a day or so. Just use greater caution. Anne asked about wetness, particularly the battery. Sealed lead-acid batteries are impervious to wetness, including direct rain. I don't know about Li-ion. Scooter control electronics is usually another story. This question needs to be answered by the manufacturer. Conventional scooters do a poor job of protecting their electronics from rain. Some people improvise using plastic bags over their control housings. Hi, I hope you will get some answers to your question Anne. I know this will probably sound crazy, but would you consider in the long-term getting 2 different scooters? One scooter may not match all of your needs, no matter which one it is. But maybe you could get one that could cope more with very wintery conditions, as well as getting something like the travelscoot for indoors in winter, or for when the weather is a bit better in Spring/Summer (which is probably most of the time you would be using a scooter outdoors anyway). You could think about which is likely to be more useful to you, most of the time, and go for that one first. Another issue is tranportability and whether you could manage with another type of scooter anyway? If (like me) you could only manage dismantling and lifting the Travelscoot, even though it might not suit all possible life circumstances, it might be to some extent the only realistic option to give you general mobility. 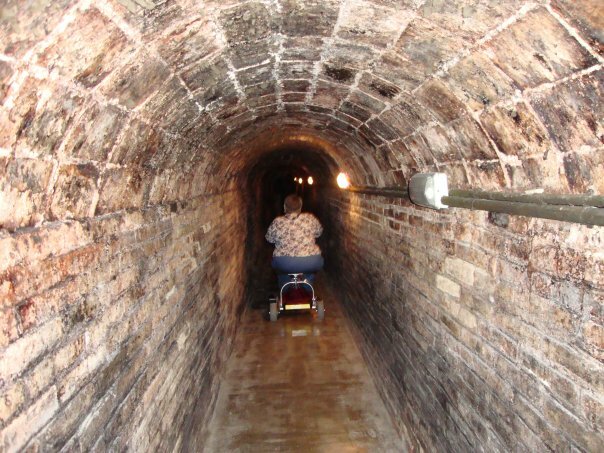 For me it was either the Travelscoot, or a much more expensive electric wheelchair (which would then lead to transport problems, as I don't drive, or have the money for an accessible car), or just not doing things. 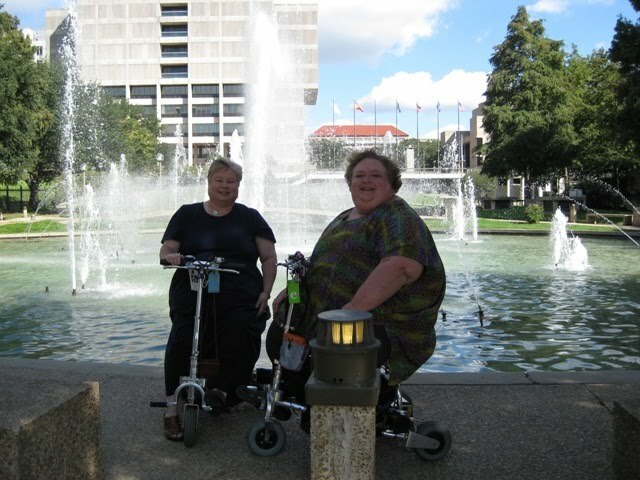 I did use a manual wheelchair for years, but it was very frustrating relying on others to push me. I also had another mobility scooter for years. This could be dismantled, but it was much too heavy and awkward for me to do this alone, and even too difficult most of the time with help. So I ended up just using it a bit around where I lived, which was better than being stuck in the house, but a far cry from being properly mobile. I kept this old scooter after getting the Travelscoot, mostly as it was not worth selling for what I would get for it now. I thought it might also be useful to have a back up, especially if the weather was very bad and I absolutely had to go out (as the battery is more covered). Though to be honest, for myself, if I had had the Travelscoot first, I wouldn't have bothered to go out to get another scooter. But this could be different if we had more weather problems where I live. So crazy as it might sound, I now have a manual wheelchair (which I have hardly used since getting the travelscoot), and 2 mobility scooters! Anyway, not sure if my comments are of any use. I am in Ireland, and though we do not get much snow or daytime ice, we get a lot of rain. I just organise my activities a bit around the weather. I am free to do indoor things whatever the weather, but save outdoor things for days it is not raining. If it starts to rain when I am out, I just nip in somewhere nearby until it stops. Lukily, here, you normally feel a few drops before the rain comes down properly, so there is plenty of time to get inside. On this (Elizabeth's) website there is a link on the left-hand side, TravelScoot Reviews. If you click on that you can see that there are also links to reviews of other wheelchairs/scooters, as well as general articles. 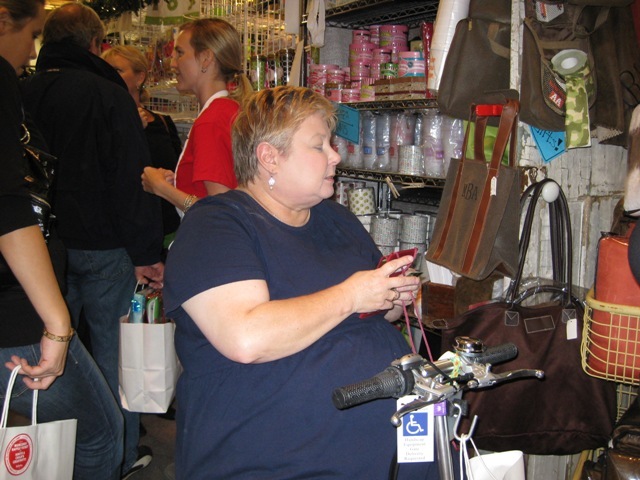 It doesn't seem that unusual to have a few mobility products. Anyway, sorry for the long reply. This is my first blog post ever! I think the website is great Elizabeth. I too am curious if anyone in a snow area has a TravelScoot. I am in Idaho and this will be my first winter with the scoot. I have no plans to "ride it in the snow" but I do plan on riding it to do my shopping and what not when the parking lots are plowed. This post began on Facebook. Hopefully some of you will have more helpful comments for Denise. Question about air travel....have you flown with your Li-ion battery? United told me today that I can not and will have to use my SLA. What has been your experience Elizabeth. We are flying Washington IAD to Rome in 10 days. Hmm, I was under the impression that the small Li-ion met regulations & that only the new, larger one did not. Ok, I just checked, http://www.travelscoot.com/batteries.htm and the DOT site http://safetravel.dot.gov/larger_batt.html and the small LI-ion IS approved for airline travel. One gram more and it would not be allowed. "TravelScoot on airlines: The FAA regulations about Lithium batteries are for stand alone batteries or in conjuction with general equipment. For batteries in mobility devices they have relaxed rules, see http://www.faa.gov/about/office_org/headquarters_offices/ash/ash_programs/hazmat/media/MaterialsCarriedByPassengersAndCrew.pdf According to that the airline only want to know whether the battery is spillable or non-spillable. Even spillable batteries are permitted but they will be stored in special boxes and kept upright. 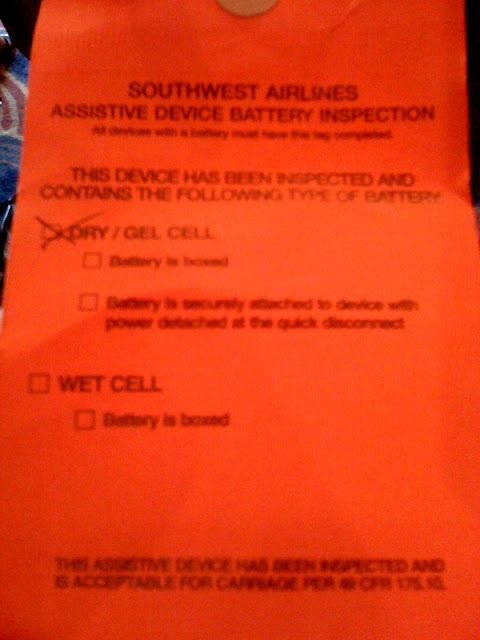 All TravelScoot batteries are non-spillable are marked as such." If/when you call United back AT THE AIRPORT, ask to speak to the 'CRO' aka the Crisis Resolution Officer. This person is required to be on call 24/7 and knows all the Air Carrier Act stuff that the regular staff doesn't know. "United will check your personal wheelchair free of charge along with luggage. Battery-powered wheelchairs—with dry cell, wet cell, gel cell, or non-spillable electric storage batteries—are acceptable, but certain safety procedures must be followed in preparing the wheelchair for carriage. Reservations personnel will be happy to answer any specific questions." I'm flying Continental with my Travelscoot tomorrow for the first time and will report back. Denise, I have flown on 4 flights with my Li-ion battery, and never had a minute's trouble, but it was inside the US. 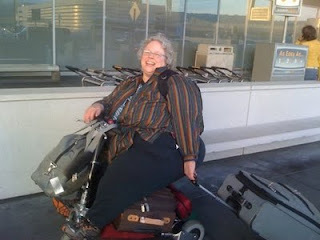 Lynn Ellen flew to Australia with her scoot and two Li-ion batteries, and didn't have any trouble that I know of. Maybe she'll see this thread and comment. I really agree with what Marlee said about calling United. The photo above is of Lynn Ellen at the beginning of her flight to Australia. You can't see it, but she's got two Li-ion batteries attached under ALL THAT LUGGAGE! This is a post from Anne, who is hoping someone has experience with snow. Anybody? 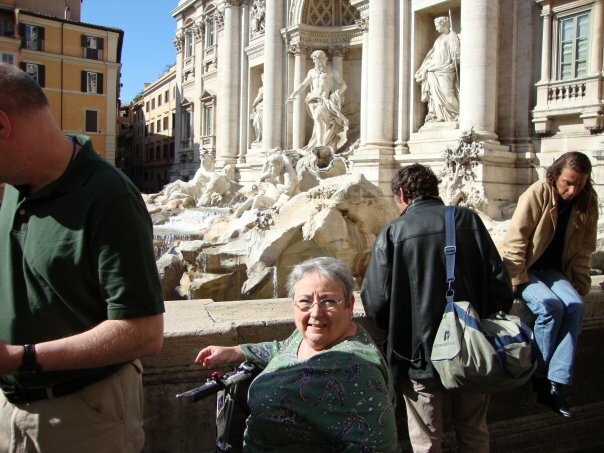 This is my first post about Nancy, who found about the TravelScoot on a cruise she was on last March. Welcome to our group, Nancy! I have a TravelScoot Junior with 2 of the smaller LiO batteries. I am 5'2" and weight 160 pounds. That is before I started eating the Chocolate Cheesecake I am eating on now (grin). I have ALS so I will only be able to use it as long as I can use my legs, but I just love it. I use it for work and shopping and can easily get it into and out of my van. I have two airline trips coming up and I am looking forward to these travel scoot adventures. I saw a TravelScoot on a cruise out of Houston last March and that was how I heard about them. They are wonderful. Rhonda and her husband Dave went to the mall Saturday and Sunday. I don't want to put words in Rhonda's mouth, but I suspect that adventure wouldn't have been possible without her TravelScoot. The picture is of Rhonda loading her scoot into her Honda CRV. We actually went to the mall yesterday and today. We covered the whole mall both days holding hands while I scooted and he walked. Dave was so impressed at how much stuff the scoot could carry. He kept worrying that I would be overloaded and I kept adding stuff to the hook and the triangle basket. We encountered a few curious people which prompted Dave to ask how we ever get to have an adventure with people constantly asking questions. We met an old couple who were looking curiously at the scoot. I struck up a conversation and before I knew it Dave was giving all the details to the husband. He was so cute. We also encountered a group of rude people. We were waiting for the elevator at one point and as I was beginning to enter the elevator a group of young people went rushing in front of me. "Dave the Babe" warned that they had better squeeze against the wall and watch their feet because I had been there first and was coming aboard. When someone complained that it was too crowded after I entered the elevator, Dave told him that maybe next time he should be a little courteous. Have I told you lately that Dave is my hero? I received this email from Bill Fabrey. Bill was a founder of NAAFA. He's also the owner of Amplestuff, a store that carries things for plus and supersize folks. Most importantly for us, he's an electical engineer. You are doing a wonderful job on your Travel Scoot mailings! The photos are excellent, and the information is vital. I want a Travel Scoot, and I don't even have trouble walking! Just so you will know, the larger lithium-ion battery is less likely to overheat simply because its capacity is so much greater. It has to do with "energy density". 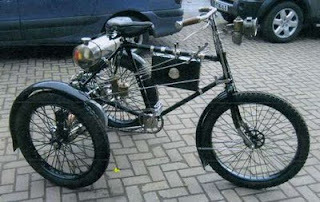 If you are traveling with a heavier load, or uphill, or on a carpet or wooden bridge, as in your example, the current demanded from the motor is greater--which leads to more heat in the motor (causing it to trip out now and then--even in so-called heavy-duty scooters with 450 lb weight limits.) The same increased current that heats up the motor also heats up the battery. The smaller the battery, the greater the temperature rise for the same current flow. With lead-acid batteries, the effect is negligible, but lithium-ion batteries, even though they store so much more energy per pound of battery weight, are more temperature sensitive. Heat is the Achillies heel of lithium batteries. It is analogous to a horse pulling a plow. A mule pulling the same plow through difficult soil at the same rate of speed will heat up faster, and refuse to continue. A draft horse or oxen (or team) pulling the same plow, doesn't get phased. OK, another example: Driving a model-A Ford up Mt. Washington vs. driving a Lincoln up the same incline. The model-A will boil off all its anti-freeze and refuse to continue. PS - Confession: Despite my advancing years, I have not PERSONALLY EXPERIENCED driving a horse pulling a plow, or driving a Model A. I have, however, driven a Lincoln up Mt. Washington. Yes, it overheated, but within tolerable limits. Even though the luggage plus the passengers exceeded its rated capacity. (Knowing me, you will not be surprised to learn that the passengers were of the generously-proportioned variety. LOL). Shopping without taking tiny painful steps. Yeah! Krystal just had her first shopping adventure! I love it that she was enjoying herself so much that she forgot most of what she went in the store for. Go, Krystal! My first shopping trip using the Wal-Mart buggy was a success except for one thing - I was having so much fun I totally forgot most of the things that I came in for! It's so wonderful to be able to zip around instead of walking like a hurt toddler. Then I remembered I wanted to check out Bed, Bath and Beyond. There's a real test of maneuverability capabilities. The aisles there are very close together. They didn't have the silicone baking sheet I wanted, so I popped over to the Target next door. Yes, I grabbed a buggy. I think I'm getting the hang of it. And no, I still didn't remember what all I forgot at Wal-Mart, but they did have the baking sheet. Oh well, guess I'll just have to go back out again this afternoon. That's one way to get practice. OK, folks, the price variance is huge! Be forewarned, it received poor reviews at Amazon, for a ridiculous reason, which prompted me to write my first ever, I believe, review pointing out (indirectly of course)the fallacy in the issue. Mine has been on my rollator for 3 years, in the back of my car & although it feels a little flimsy, groceries, boxes of books, & luggage have been mindlessly dumped on top, with NO damage, nor has extreme heat in the parked car affected it. My motor overheating is a "once in a great while" problem, but it does happen. I didn't want my battery review post to be confusing, so I'm putting this as a separate entry. Even though Leo the L'ion performed beautifully at the zoo, over the course of a couple of hours my motor overheated three times. The first two times were after I'd been riding for awhile and then gave it a bumpy wooden bridge to struggle with. The third time was after I'd ridden my great nephew Jaxon around and around and around and around and around and around. If your first thought is, "Oh no, I don't want a scooter that does THAT!" keep in mind that I'm much larger than the average rider. My friend Rhonda, who is about 250 lbs., doesn't have these same problems. Yes, her battery has overloaded on an incline, but it happens far less frequently than it does for me. Also, in everyday use for work and shopping it's rare for these things to happen even to me. I did have the smaller lithium ion battery overload twice on a recent shopping trip at the mall, but the first time was because I was in a jewelry store with incredibly plush carpet and the second time was on carpet when the battery charge was already low. So... how do you know if it's the motor overheating or the battery overloading? In both cases the scoot just suddenly stops, leaving you wondering what just happened. If you try turning the throttle, it doesn't do anything. The way you'll know which thing happened is by looking at the lights on the on/off switch panel. Battery overload: Red light on display or no light on display. Motor overheated: Green light indicating the battery is still giving you power. What's the solution? If the motor has overheated just sit for a few minutes and give it a chance to cool down. I wasn't timing it, but it wasn't more than 5 minutes before I was moving again. If your battery has overloaded you can either charge it again briefly to turn it on again or use your scoot as a generator and, leaving the battery in the on position, get off and give it a couple of hard pushes until the battery light turns green again. (My husband and sister Rae have gotten mine going for me again by running with it.) If you were on an incline when the battery overloaded, turn around and try going back down the incline. That's always worked for me to get the battery going again. Reviewing the new battery, or "Leo goes to the Zoo"
Speaking of my new "gold brick". The parking lot where I usually shop has a fairly good slope to it. I try to park on the down hill side of the slope so I don't have to worry about my scoot making it up the slope with me and all my groceries. Today the store was packed and I had to park at the top of the slope. I spent nearly $200 on groceries and what not (I have company coming this week) so you know I had lots of poundage in my TrolleyBasket and hanging from my scoot. Not to mention the 400+ pounds of fabulous sitting on the seat. The regular Lithium Ion battery would flash yellow at me when I attempted this slope in the past with this much of a load. The double did not flash yellow once I gave it full throttle all the way to the car. I hope it keeps performing like this I was impressed. In a previous post I wrote about the Tulane Transplant "Gift of Life" Celebration on Saturday, which was held at the Audubon Zoo in New Orleans. After the celebration Alan and I headed out to enjoy the zoo and put Leo through his paces. I can't explain the technology behind this new battery, but Hardy did tell me that it should work better on inclines. Was he right? Saturday was an extremely hot day and I scooted over lots of surfaces from grass, to cobblestones, to some uneven wood planks, and many places where there were gaps in the concrete or where the cut outs weren't as smooth as they could have been. My scoot handled it all beautifully. It went over small bridges and up inclines like a champion, even though it was a blisteringly hot day. The BEST part is that Leo never overloaded, not even once, and given past experience, I am quite certain the smaller lithium ion battery would have. I give it several big gold stars. Yeah! In the pictures below I'm trying to catch up with the zoo train. Rhonda would describe this as "mama duck and baby duck." If you look closely you can see that I have both my lithium ion batteries stacked. I never needed the smaller one. On Saturday, while Peggy was in Audubon Park in New Orleans for the Memory Walk, I was right next door at the Audubon Zoo for the 2009 Tulane Transplant "Gift of Life" Annual Reunion Picnic. In 2005, my younger sister Rae gave a kidney to my older sister Georgia. Saying that it changed both their lives doesn't begin to explain the impact on our family and our future. For more information on how you can donate life, visit http://www.organdonor.gov/. Having a TravelScoot enabled me to be there, and to fully enjoy the zoo. Me with my great nephew Jaxon. He LOVES my scoot! Rae's Certificate of Appreciation. Click on it to see it larger. Alan taking a self portrait of us. Click to see it larger. We ARE in there! The people who are standing and holding certificates are all living donors. What a great group of people! My niece Shelly and her daughter (and my great niece) Madelyn. Shelly with her children Jaxon and Callie, my great nephew and great niece. From Peggy: This is Silver (my TravelScoot), Jimmy (my parrot "horn"), and me at the Memory Walk in honor of family and friends. Peggy sent me an email yesterday with this picture, and told me that one of the people she was "walking" for in the Memory Walk was my mother. Having dearly loved someone with dementia magnifies the importance of what Peggy and scores of others did in New Orleans on Saturday. Bless you all! Prius trunk w/ Scoot, battery, & 2, wheeled shopping baskets called Trolley Baskets. Mine are adapted for use with a scooter, but they are also sold to grocery chains, & individuals, for use by walking people as well. Holder can expand even more. I need to move it down so that it is just above the basket. The TravelScoot is shown here partially collapsed. The Prius floor can be lifted out, creating an even deeper well in back and in that configuration the Scoot doesn't need to be collapsed. For that matter, the back seats both fold down so there is lots of room even with Scoot in place. Notice that in these photos, the front basket is still attached, even though the scoot is folded. Attaching the battery. Be careful not to plug the red connector too firmly, or you'll have trouble disconnecting it. Putting on the seat back, which, btw, does not have to be used. Jim said it took under 3 minutes for me to to assemble it the 1st time, and that was with a defective, and difficult, battery connection which has since been replaced. We dug luggage out of the attic to show friends what they could do if they had a Scoot. Spreading the joy, and singing of freedom! Ooops, cut it too tight...where's that porter? This photo also shows how the luggage handle is looped over the seat post and explains how you could carry multiple pieces of luggage under your legs if they are on their side rather than flat. Look what Georgia C. has been up to!